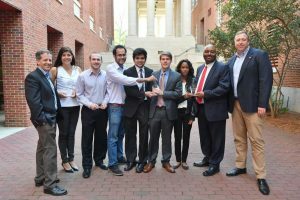 The Ole Miss Center for Innovation and Entrepreneurship announced the winners of the 2016 Gillespie Business Plan Competition on April 8, 2016. The competition, sponsored by the Mabus Agency and Renasant Bank in its tenth year, began on February 21. The pool of 40 business teams narrowed to six finalists from which Nimble Fashion prevailed as the winner and recipient of $10,000 to apply to their business. Kiparizoska and the Nimble Fashion team competed in the 2015 competition and came up short in the finals, but continued to work on their business, and launched an iOS in January of this year. Following Nimble Fashion was the second place winner of $5,000, Drone Storm, a propriety piloting application for drones. Okay2Eat, a program to assist those with food allergies, won the third place prize for $2,500; and the illiteracy combating application, SeeHearSay, won the $2,500 prize for Best Business for Mississippi.